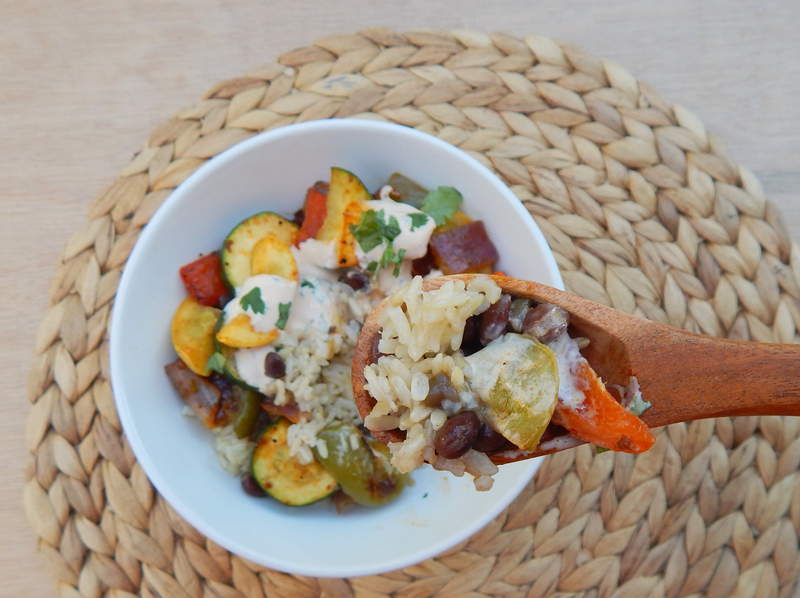 Dig into these hearty and healthy roasted vegetable brown rice bowls! 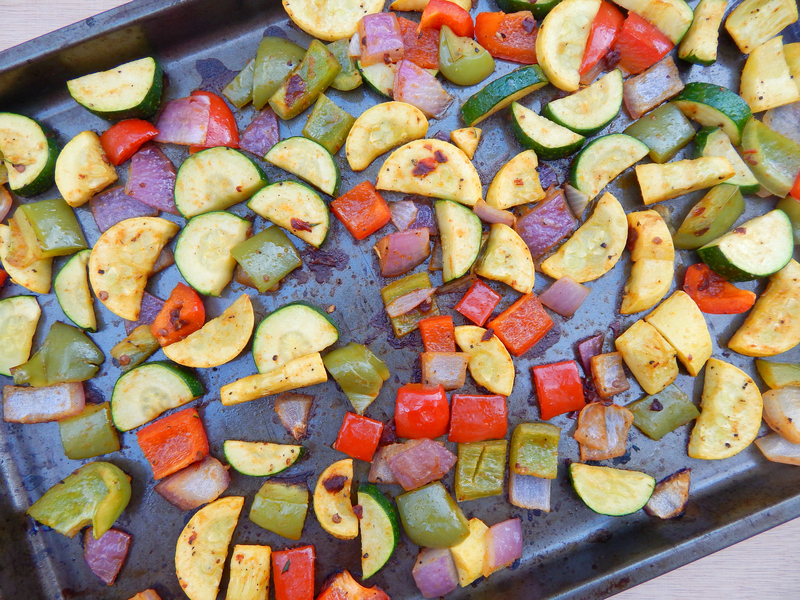 The vegetables are roasted with extra virgin olive oil and chipotle peppers for added spice and flavor. Throw in some black beans and top it with a tangy lime sour cream sauce. The sauce is optional, and the bowls are delicious without it too. Use any veggies you have and customize it to your liking. This is an easy meal to prepare in advance, store in refrigerator and have ready all week. 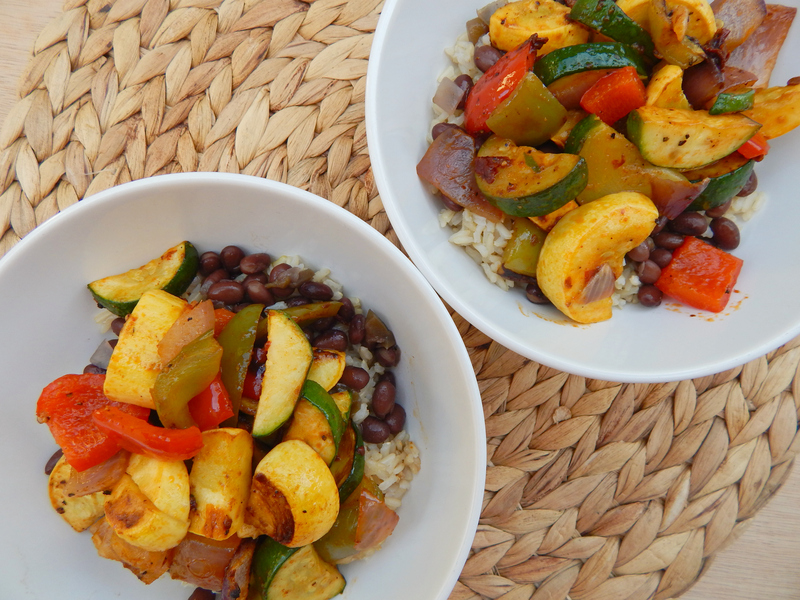 The recipe is vegetarian friendly or ready to be served with a protein of your choice. Make it and enjoy a nice hot meal on a cold day. Today I woke up with a sore throat. Blah. Last night was cold here (well, cold for southern California) so I turned on our heater. We had gotten home late and got ready for bed right away. I put on my new cozy pink and purple pajamas, thank you black Friday deals, and I got into bed. Without me noticing my polar bear husband turned off the heater and cracked open our bedroom window. Fast forward to morning time and to me freezing in a 63 degree house. With a sore throat. Thanks, babe. So back to these bowls, if you don’t dig chipotles or spicy food leave them out and add in your favorite spices and seasonings. Again, totally customizable. I used the Cuban Style Black Beans from Trader Joe’s, but they didn’t have as much flavor as I wanted. Next time I will look for another brand of whole black beans or make my own if I have the time. You can also use white rice if you prefer it over brown. 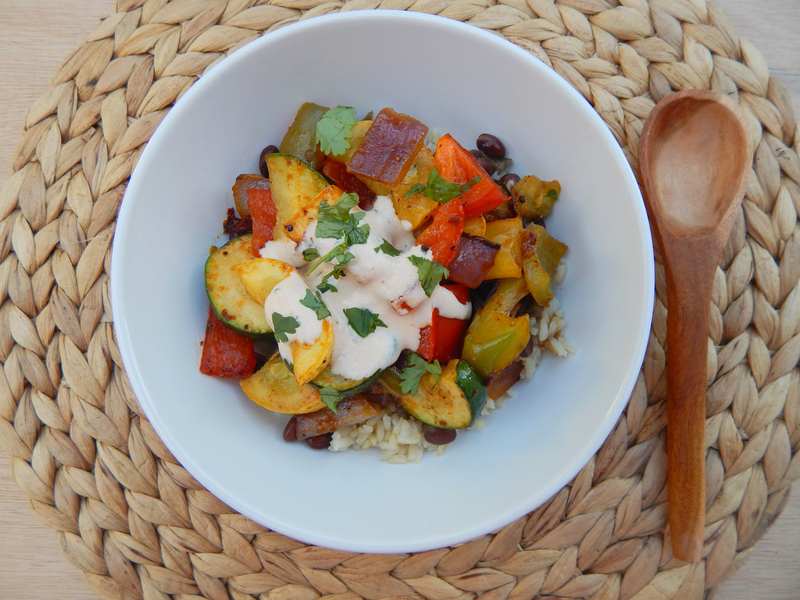 The roasted veggie bowls are delicious at this point! Dig in and enjoy it. But, if you want a little extra flavor and a sauce make my tangy lime sour cream to go on top. Back to work I go tomorrow after a very enjoyable few days off for the holiday. I got to spend time with my family (boozy spiked apple cider and wine included,) I got lots of sleep, and we took a day trip to beautiful Lake Arrowhead, California with our good friends. Tommy and I put up our Christmas tree today and I ordered my Christmas cards. I think my December is off to a good start minus the sore throat of course! 1. Preheat oven to 425 degrees. Cut all vegetables into small chunks of about one inch squares. Add all chopped vegetables to a large bowl and combine with olive oil, salt, black pepper, granulated garlic, chopped chipotle and chipotle adobo sauce. Mix well to combine all ingredients. Add to a large baking sheet and spread evenly into one layer. Roast vegetables in the oven for 14-17 minutes until they are softened and have developed some color. Remove from the oven and set aside. 2. While the vegetables are roasting heat the black beans in a small pot over medium until heated through. In another small bowl make the sauce by combining the sour cream, chipotle adobo sauce, lime juice, cilantro and salt and set aside. 3. 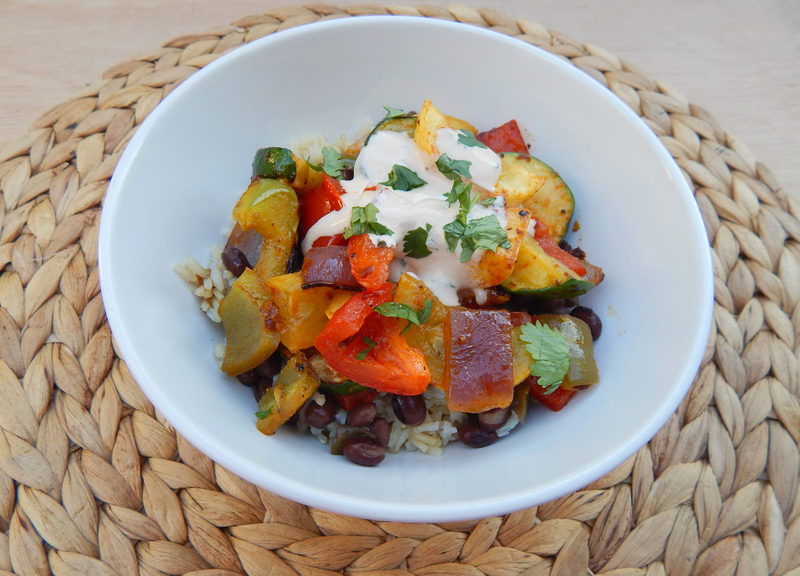 To build your bowl add 1 cup of cooked rice to the bottom of your bowl, top with about a quarter cup of black beans, and top that with about 1 cup of roasted vegetables. Lastly top with the Lime Sour Cream Sauce and chopped cilantro. Enjoy! 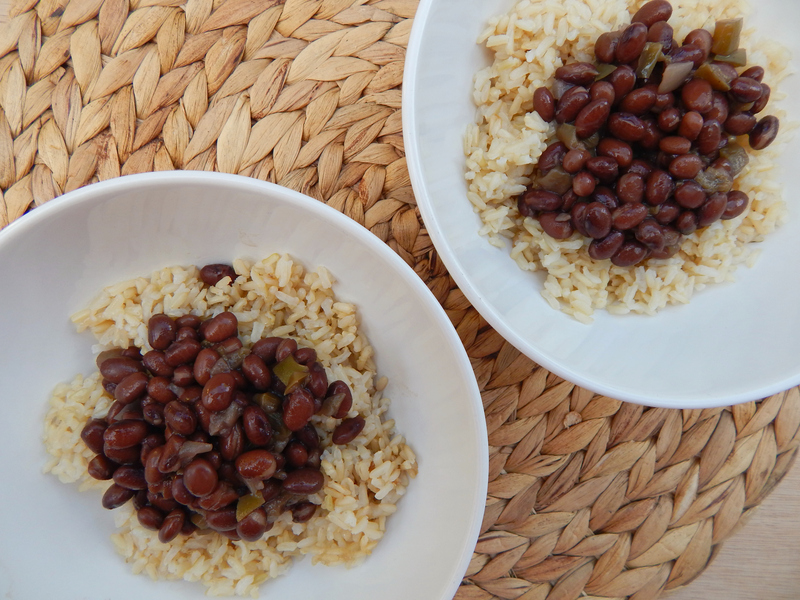 • Use Latin style black beans for added flavor. • Cook rice according to package directions. • Use any vegetable you like or have on hand. • If you are worried about your vegetables sticking to the baking sheet add a little olive oil to the bottom of the pan, but I did not have to do this. Thank you 🙂 feels good to eat good food right? !